If you garden and are eating fresh and seasonal, then you probably know that pea season in the Northeast is just about to end. We have had an over abundance of peas in our garden this year. Buddy and I have been outside picking them almost every evening! Studies have shown that green peas stand out as an environmentally friendly food. Agricultural research has shown that pea crops can provide the soil with important benefits. Peas are also a low-fat food and are high in protein. They also contain a unique assortment of health-protective phytonutrients and are high in Vitamin K, maganese and Vitamin C. They also contain fiber. Here is one of our favorite pea related recipes that I thought we would share. It has become a mainstay in our household, particularly during the summer months when we cook outdoors. It also goes very well with grilled Garam Masala Chicken. 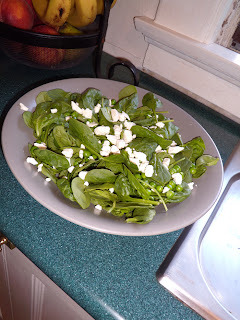 With the addition of some nuts, this salad would also make a very good vegetarian entree. Or leave out the cheese and just add nuts (and maybe soy cheese) to make it vegan. You could also add chicken or shrimp to it very easily. It's really versatile. Spinach, Pea, Feta Salad is from Jamie Oliver's first cookbook, "The Naked Chef" copyright 2000. A book that I believed not only changed how cookbooks are edited, styled and formatted today, but also helped and encouraged people in the US to eat fresher and healthier in a fun, enthusiastic way! ...take 2 large handfuls of baby spinach, wash and add 2 smaller handfuls of baby peas (raw if you get them young and fresh otherwise you'll have to blanch them). Dress the salad at the last minute with olive oil and lemon juice dressing (below) and then sprinkle it with crumbled feta cheese.